I just won this auction: http://cgi.ebay.com/ws/eBayISAPI.dll?ViewItem&item=260898061884. I already have a beautiful SC 1211 shell (with dial shroud) on my kitchen wall, but the original guts were from an intercom. It now contains a WE network. I hope to use the guts of the SC1211 I just won to make mine into a real SC1211. If the shell from this one is in good shape, I will probably try to sell it. The other two phones in this lot: SC1248 (magneto) and 1244 do not interest me. If anyone would like to buy them, please contact me. Nice catch. I couldn't figure out how I missed that auction, but I noticed the Seller misspelled Stromberg, so it wasn't included in any of my searches. There's no way he's going to mail all of those for shipping that came up on my screen. Congrats! I see "Stromberg" misspelled "Stromburg" frequently. I'll have to change my search terms to include misspellings. A SC 1211 is high on my want list. A SC 1211 is high on my want list. ]A SC 1211 is high on my want list. Hope you don't mind my adding my purchase to your post here. I picked up a 1210 the same day as your find, but unfortunately I paid a lot more than you did. Mine is marked 1210, and I can't find any information about why it's a 1210 and not a 1211. The bakelite on this one looks like new. I don't think this one has very many miles on it. Another oddity is the dial number card ring. Someone installed a WE card ring - you can see in the picture of the back the hole where the normal card holder would have been screwed into place, but it also has notches for the WE ring, and they bent the tabs over. Did this shell come with those two extra cut outs, or did someone add these? I don't mind your hijacking my thread. I am glad to see that your phone is in such great condition. My phones arrived on Monday. The guts of your 1210 look just like my 1211. I cannot imagine what the deal is with the holes for the WE card retainer ring. I seriously doubt that SC would have made the shells with those holes, especially on a diagonal. When I first saw the ebay listing picture of your phone, I thought that the retainer ring was like one that I have which has a hole in the center of the back part and a little tab sticking out from the ring. I haven't tried it yet, but I am guessing that this will fit into the card area on an SC1211. Yesterday, I swapped the base of my pseudo-SC1211 (pictured at the beginning of this thread) with the base from the new one, so now I have a genuine SC1211. The new shell is in better condition than I expected. I didn't notice any chips and only one tiny crack next to the handset cord opening at the bottom. There are a few scratches and wear marks from the handset, but overall, it looks pretty good. I am planning to post pictures of it after it has been cleaned and polished. I will probably want to sell it along with the base, which currently has a WE network. Your center rings looks like the cover for the mercedes #23 dial. Complete with the press on ring. 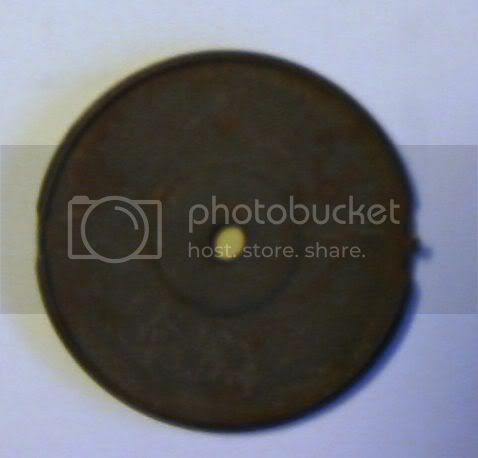 Is there anything metal on the back side that the screw threads into, or does it just thread into the bakelite? Your center rings looks like the cover for the mercedes #23 dial. Complete with the press on ring. I originally figure that it was something like that, but then, when I saw your phone picture, I started thinking that it would work there, but I may be wrong. 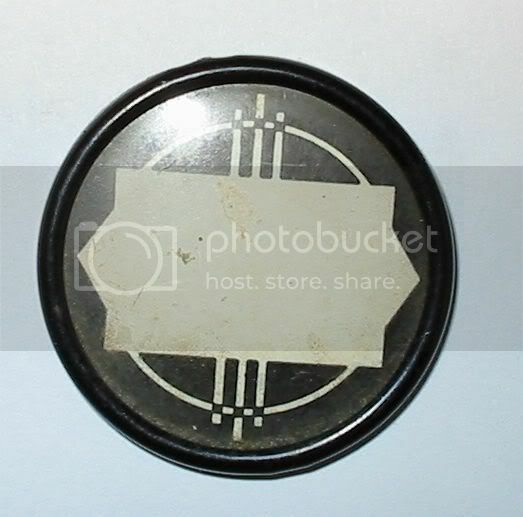 The SC dial cards are held by a metal pin in the center. It presses into the hole in the bakelite. There are no screw threads. My SC1191 (http://www.classicrotaryphones.com/forum/index.php?topic=3041.0) has the same thing, except that the hole is in the ringer gong, which is metal. 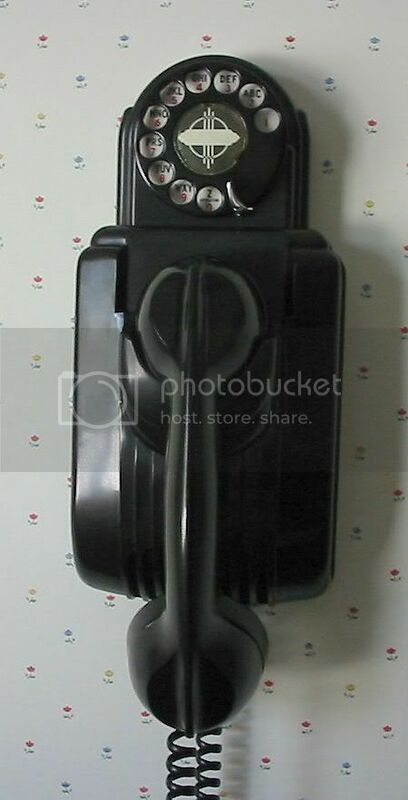 Up for auction is an antique Stromberg-Carlson Model 1210 wall telephone. It is a no-dial/extension phone similar to the SC1211 but without the dial casing, dial or dial harness (or the facility to accommodate these things). Great - thanks. I did a search but couldn't turn anything up. Guess this means I'll have to buy another one with the dial now! You can certainly add a dial with a bit of rewiring, but finding the dial shroud may be a challenge. Given your talent for finding rare phones for bargain prices, I expect that you will find one. My SC1211 is my working kitchen phone. It replaced an AE50. It wasn't an easy decision, but as great as the AE50 looks, the SC1211 still beats it for style and art deco-ness. It's fun when people come over and they cannot believe that the phone on the wall (or various other things around the house) are really 70+ years old and actually work. I am still looking to sell the SC1248 and probably the 1244 as well. I don't want to list them on feebay though and spend all of the time and effort listing them for a few dollars profit. Kleenax (Ray K) makes dial shrouds for both the SC & Kellogg "Tombstone" type phones.